The Gibson M2 S-Series: USA-made Les Paul-Shaped Sonic Demon!! Update: I’ve written a second review with lots of pictures of the inside and outside of my M2. 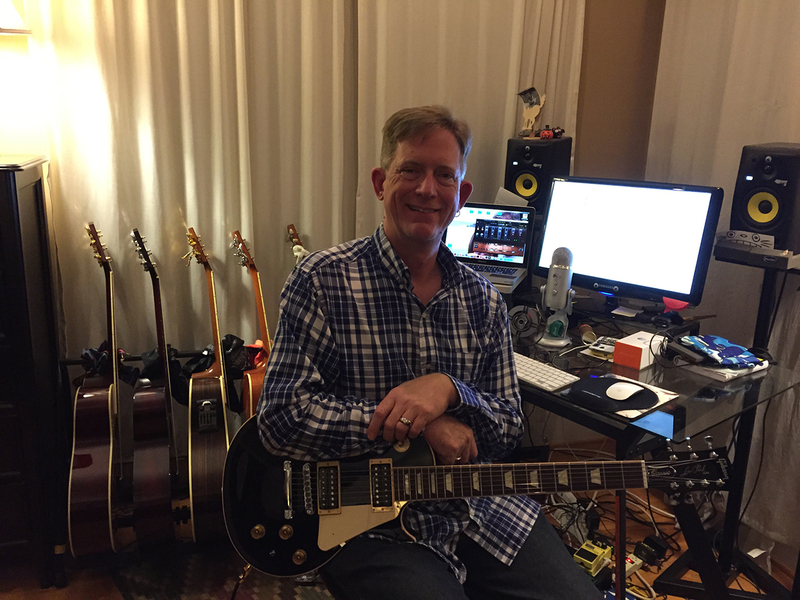 I was fortunate this past Christmas holiday: my wonderful spouse bought me a Gibson! I had been eyeballing the Amazon-exclusive M2 Electric Guitar since they were available on the Amazon site. I was particularly enamored with the Citron Green. Having played my Gibson Firebird Zero for a while now (with my awesome Gibson 57A3 pickups plugged in to the quick-connect system after I took pictures, modded the Zero, and started recording! ), I’m very happy with the S-Series. This green monster is wonderful at about 2/3 the price (on sale) of the Firebird Zero, with very few compromises. I’ve actually kept my eye out for another Amazon sale. I’m hoping to grab a blue, gray, or red one! zZounds does not have the Gibson M2, since it is an Amazon exclusive. But you can still get the Firebird Zero S2-Series Guitar here! The Gibson M2 S Series LP-shaped guitar is a wonder of simple engineering, USA handmade goodness, and a perfect student’s instrument! I can’t express enough the fact that this guitar sounds, plays, feels, and IS better than pretty much every Asian-made beginner’s guitar on the market – at any base-model price. It comes in lots of colors, including an almost PeptoPink, it’s easily available, and Amazon backs up their exclusive Gibsons with their usual easy-return customer service. You can try one out with the knowledge that it is backed by a pro-customer-service company. You can see the specs and buy the M2 here at Amazon.com (opens new window). The new Gibson M2 electric guitar is huge on features for such a low-end guitar, is made in America, and is the absolute pinnacle of well-made very basic entry-level guitars. You would be hard-pressed to find a nicer and better-playing guitar in this price range with a gig bag, much less one made in the USA. I do see that many Poly-Painted Epiphones are nicer in features and glossy finishes: but the Epiphones still don’t have that American touch to them. – Neck profile: Slim taper (this is similar to the 60s neck shape on many SGs and Firebirds – but it feels narrower in some way. Each one I’ve played is typical Gibson: hand-hewn and a little different from guitar to guitar. – Nut: Tektoid – mine are nicely cut and required no work. Nice job on this one Gibson! – Bridge: Adjustable wraparound – this guitar’s cost has a savings by not including the stop tail and its studs. – Knobs: Black top hats – these are the traditional “student” Gibson knobs. They’re slippery to me, so I usually replace them with knurls or speed knobs. – Tuners: Mini-buttons – these are a surprise hit! These are a cost savings over Grovers – and the ratio is actually really nice! I know that the M2 isn’t available outside Amazon, but there are other affordable Gibson S Series electric guitars out there at my favorite online retailer: zZounds.com. * The paint finish is lacquer, and has a nice smooth feel to it. It’s a bit more satin than the Firebird Zero lacquer, and you can see and feel lots of Poplar grain with your eyes and fingers. It’s interesting: you can see the beautiful waves of Poplar grain on the top and the back of my M2. It’s attractive, actually. The guitar feels right at home when I play it. * The neck is a nice semi-satin. It doesn’t grab at the player’s skin when palms get sweaty: and it still feels much smoother than most maple necks on inexpensive guitars. * The electronics are loosely based on the Gibson Quick Connect system. The pickups can be easily switched with others that have the five-pin Quick Connect fitting. A VERY easy upgrade if you ever want BurstBuckers, maybe some 57s, or something screamin’ like some Gibson Dirty Fingers humbuckers or a Gibson 500T Super Ceramic! * All the non-pickup electronics are attached to the pickguard: to work on them, you don’t even have to pull the strings. The pickguard is completely unfettered when the guitar is strung. * The controls are simple: one volume, one tone, and a three-way. The jack is front-panel, easy-to-use and will accept an L-connector guitar cable. * The tuners! WOW. I’m still blown away. Just as nice as the Firebird Zero, just 3+3 instead of inline. My first thought when I saw the pictures was “I’ll find some Klusons or Grovers and replace those: they look maybe too cheap.” I WAS WRONG. They’re high-ratio (maybe 18:1 or 19:1? ), very smooth, and work really very well! * The M2 has a new take on a Melody-Maker-like headstock: it’s thin, without the added wood to give the wide sweeping book-top headstock, but it still looks like Gibson. * I’ll say it again: it comes with a simply nice gig bag. You rarely get a gig bag with entry-level instruments below $500. If you’re thinking about hard shell cases, it fits great in a traditional Gibson or Epiphone Les Paul hard case. it fits in my Gibson LP cases, my Epiphone LP case, my SKB LP case, and even some old-fashioned cheap rectangular cases. This guitar is nicely balanced. it is thin and light – so much so that when you put it on a strap, it is almost non-fatiguing when you stand and play for hours. 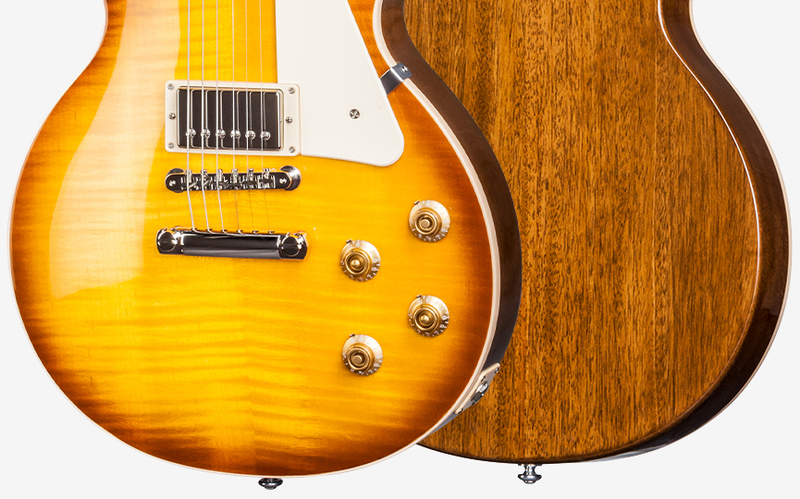 If you are a young player with small hands and a petite body, this guitar feels right at home and won’t make you topple over like a traditional weight LP Standard or Traditional. It’s perfect for comfy jamming. Similar to the Gibson Firebird Zero, I like the finish. It feels good when you’re playing the guitar. The M2 is more satin than the Zero, but it is FAR better than the flat-black guitars that proliferate in the entry-level guitar market. With most non-gloss guitars, fingerprints and funky patches crop up on the first day you play them. With the M2, it looks like the finish has just enough natural gloss to wear in nicely and make a breathable instrument in its old age. Gibsons Galore Gather Gleefully and Graciously with Goodness at my awesome Sponsor, zZounds.com. For me, the best two measures are: Absolutely clean straight circuit with no effects and no pushing the pre-amp; and a good tube pre-amp running just hard enough to make the sound just a touch growly or fat-jazzy to really feel the body of the sound. Of course, other types of play are important, such as rock, jazz, metal, new age, pedals and such, but the first two of these are the most telling of all. Me? I like a balanced pickup with all three main EQs about equal. I want the pickup to clean up for jazzy or mellow passages, and I want it to have crystal clarity when I overdrive it or run it through several effects pedals. I also want the bass sounds to be very present and clean: no mud. Miss? I like them to be present in the harmonics and not scooped out or enhanced. These pickups are different than the Firebird Zero pickups in their makeup, their thickness (sound), and their EQ. They’re a bit drier, have a bit more honk in the bridge, and reflect the thin small body and the maple neck pretty accurately. They are just that, accurate. They’re not overwhelming, they’re not bad, just accurate. These aren’t high-output metal pickups that will pop to top off your Mesa, but they drive a nice tube amp in a very respectable way. However: Compared to pretty much every bargain pickup on the market in sub-$500 guitars, these are awesome. They sound much cleaner and more refined than the average super-cheap double-black humbucker out there in the entry-level guitar market.They do clean up pretty well and can do good old heavy metal just fine. If you want to chug-a-lug some grinding country or throw down on some hard rock, they do a decent job. They’re head and shoulders above almost everything in their price/type class. I like them much better than the low-quality humbucker pups in pretty much every intro-level HH guitar I’ve owned or played. That said, remember: these are entry-level pickups. Besides, they are fun and easy to replace if want to get a black one and Get Your Tony Iommi going with some Gibson signature pickups or some Seymour Distortions (OK, or your DiMarzio Super 2s, EMGs, etc). Actually, plugging in a Gibson 500T Super Ceramic in the bridge gives a face-blowing metal sound. NICE! Just like my Gibson Firebird Zero, my wild and crazy-looking Citron Green M2 came well-painted and nicely strung. In the case of my M2, however, the Green Bean Machine Christmas M2 was much better in its setup and playability right out of the box. Interestingly, it comes in the same really nice shipping box as a top-level high-end Les Paul like a Standard, Custom, or Traditional. I liked the new plastic fret protector that’s inserted between the frets and the strings for shipment – it’s a great and inexpensive way to prevent shipping crushes causing string indents. It’s nice enough to keep and put back every time you put your guitar in the gig bag or case. My lovely from-my-super-awesome-wife gift M2 came MUCH better intonated than my Firebird Zero. it was either a good match from the parts bin, or the set up tech really spent time adjusting things. I only had to move the three plain-string saddles (kind of typical to find intonation issues on a low-end guitar. It did well for a wrap-around bridge guitar when it was properly intonated using one of my Peterson strobe tuners). Last request on this review. I pay for my site myself, write all the materials, and take most of the pictures myself. It really helps if you visit zZounds with this link and buy your gear. I don’t get credit for anything when other pages see my cookie and offer a cookie of their own. Visit my awesome Sponsor, zZounds.com. I do wish that other vendors offered versions of the M2, or maybe even just colors. I like Amazon, truly: and I do like the idea of competition and multiple sourcing. I have bought and sold a few of the Gibson V and Explorer 7-String guitars (when you can even find one, particularly the Explorer). They are great guitars: I just found the EMGs to be too sanitary (sterile and too perfect) and the necks to be just too wide. I have huge paws, so I don’t have a problem with them – I just found the necks to feel bigger than a Jazz bass neck… I REALLY wanted to love and keep the Explorer in particular but I just couldn’t do it. It felt like it was not a part of me when I played it. I sold both of them within a month of acquiring each one. I kept hoping for a great Les Paul 7. My wish was granted this year. This is REAL opinion from someone who’s actively using this guitar, with 4 decades of experience underneath my brains and hands. You can find out lots of information and pricing for other Gibson Les Paul Classics at my favorite G.A.S. providers, zZounds with a guarantee that you’ll love it! Please visit this page and buy stuff from these great folks. It helps me fund my music projects and this site. The nut material doesn’t ping as much as Corian. Nice. It’s smoother and feels a little stronger. Nice carved top that feels like a Standard, Traditional or Classic. Nice! Close your eyes and you think you’ve got a Traditional in your hands. A neck that someone carved with ME in mind: a little flat and slender at the nut and rounder at the heel. Feels great, unobtrusive, melts into my hands every time I play it… It’s a very different neck like a less-rounded Firebird or something: but know that it feels great in hand! A FANTASTIC piece of rosewood on the ‘board and excellently-balanced and leveled frets. No buzz anywhere, not even when I down-tuned to ADADGAD. When I set the intonation, I only had to tweak three strings, and they were < 4 cents off. NICE! I don’t mind setting intonation. I just felt pretty good when it only took a tweak or three. A SUPERB finish job on the lacquer finish. Excellent work Gibson team! It isn’t any heavier than my Peace or my Epi Custom. It’s lighter than my Trads. I have NO gripes about this guitar. It is a recording and jamming machine and I love it! It makes it EASY to jump from a “regular” Les or a Bari Les to this guitar. The necks are very similar. You don’t feel like you’re playing a cricket-bat-neck guitar. NICE. Folks, we can nit-pick the details. Me? I wouldn’t change anything. The silver labels on the headstock that are better than the decal type but not quite as pretty as the inlay: fine. Silver is cool. I would love nickel covers (yes, I’m one of those guys): but no-one makes nickel-covered 7 passives that I’ve seen – not something Gibson could have chosen: and besides, Seymours! Dear Seymour Duncan, MJ and all the wonderful folks at SD: Please make me some nickel-covered wax-potted 7-string pickups that are a 59 in the neck and an overwound Pearly Gates in the bridge! The recordings are superb. I must say, dropping below the 6th string to walk around the melody and harmony with some notes that dip into the bass world is just stupendous. When you get used to it, you’ll love it. The sound and playability are crisp, clean, and well-defined. You can finger pick, claw hammer, hybrid pick, and single-pick your way to heaven because this guitar puts out through tubes AND solid states like nobody’s business. Gibson, thank you for this. I’m truly happy. It’s now my number 8 guitar (a big deal, really). One of the guitars on my “to get” list is the Gibson USA Vintage Mahogany Les Paul (faded cherry). I’ve played several examples a great number of times over the past year or so… and although I could not purchase this one for myself (budget, budget, budget), I felt the need to express my view on this instrument. This instrument is a fundamental instrument that incorporates critical elements of a fabulous-sounding instrument. 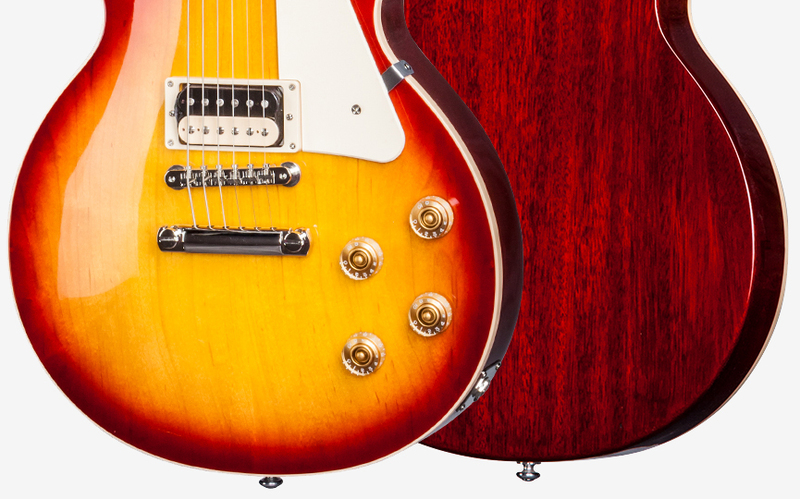 In its basic-ness, this particular Les Paul is all about sound delivery in a price-friendly Gibson package. Tone folks will find the Les Paul Vintage Mahogany to be a monster… Folks whose budgets cannot achieve the heights of the Les Paul Standard, or even the Classic or Studio, will find this instrument to be a real bargain. Perhaps enough of a bargain to truly bring great Gibson-ness to many musicians’ sound libraries. This is a fabulous instrument – stay tuned and I’ll attempt to explain why it strikes me so well. Quick Opinion: Grab one right now before they’re gone. Period. If I had the means, I would. The “Les Paul Vintage Mahogany” isn’t in production any more, but you can get the Gibson Les Paul Studio Faded series (even in blue!) here at zZounds.com (free shipping and a love your guitar guarantee!). Playability: The Gibson Les Paul Vintage Mahogany is all Les Paul. It has the chunky 50’s-style neck one expects from many Les Paul models. The neck is tapered in a subtle way, and the radius is extremely comfortable. Another interesting aspect of the neck’s playability is its consistency. It is even, smooth (if a little woody – like lots of natural-finish acoustic guitars, but not as wide), and very comfortable. As a person who truly likes the 60’s neck profiles (and the slimmer Epiphone neck profiles), the Les Paul Vintage Mahogany was different at first. However, after playing several examples over several months at my local, favorite Guitar Center, I adjusted to it. I am now more comfortable going between my Epi Les Paul and the Gibson. The body’s weight seems to be really well-balanced. It doesn’t feel as weighty on the shoulder as a traditional Les Paul – but it still retains that singing, miles-of-sustain feel that makes Les Pauls so breathtakingly essential to many kinds of music. It plays like an old friend. It feels like an old friend, and is one of the most comfortable Gibson Les Pauls I’ve had the pleasure of playing. Features: The features of the Gibson Les Paul Vintage Mahogany are varied and interesting. This particular Les Paul is a marriage of basic simplicity and killer electronics. The fretboard is very nice, the tuners are the (to me, essential) traditional green-tulip tuners. The body has no binding, and the top wood has the same feel and color of the back and neck. This particular Les Paul may be a lower-priced Gibson, but it comes with a real, deluxe Gibson hardshell case (update: This was true when the “Vintage Mahogany” was still being produced. The current “Faded Studio” only comes with a gig bag. Given that the guitar itself is about the same price, I’d say that it’s still a bargain: buy yourself a hard shell case though… it’s worth protecting.). This is unusual, considering the fact that some of the other “worn-finished”, less-expensive models only come with a gig bag (such as the Vee and the SG). 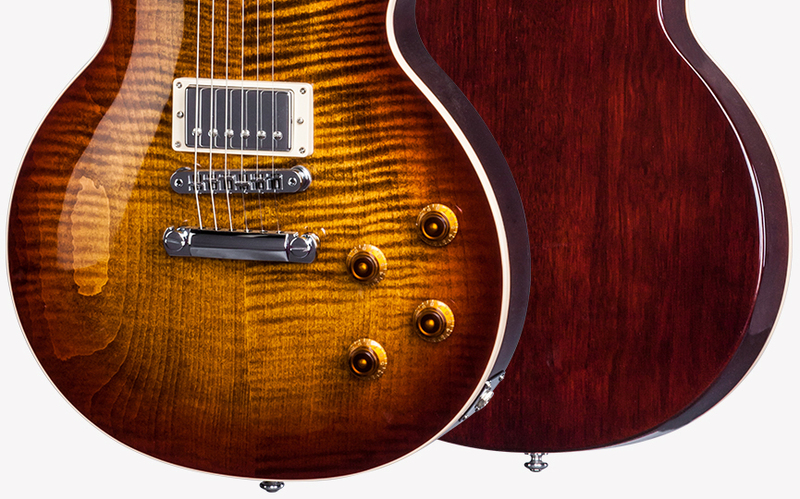 By far, one of the greatest values in the Vintage Les Paul Mahogany is its pickups. It comes with Burstbucker Pro humbucking pickups. I don’t know how different the wiring is (as opposed to the Standard, Classic, or Studio), but the sound is absolutely awesome. The Burstbucker Pros, combined with the case, make this guitar feature rich – even though it isn’t a fancy Les Paul. Sound: Sound, sound, sound, sound, and sound. WOW. Pick up an old or vintage Les Paul, close your eyes – pop it through some Marshalls or even a deluxe Twin Reverb, dial up the amp, and let loose. Now do the same with one of the Vintage Mahogany Les Pauls. Listen… No matter if you can scream like Vai, cry and wail like Lang, or rip the souls of the audience into happy little pieces like Gilmour, or just play like a regular Jane or Joe, this instrument does not disappoint. It takes that vintage-ness of the old PAFs, adds more output, and makes the dynamic range of the sound more (a good thing) complex and rich. I’ve played several of these through a very wide variety of amplifiers, including nice Class-A Mesas, wide-rich VOXs, chunky Marshall stacks, cheap starter combos, Fenders, and some Kranks and Line 6s… this horse can not only trot, canter, or gallop – it is a true thoroughbred: it brings crunchy, singing, sustaining sound to any style, amp, pedal, or volume. Value: Based on its sound, its case (again, back when they were produced as “Vintage Mahogany”), its Burstbucker Pros, and its made-in-USA pedigree, this is absolutely worth much more than its street price. I’d put it at around $1k any day. The fact that you can buy it for much less makes it a 12-out-of-10 value any day of the week. If you’ve been thinking of going Gibson, or if you’re looking for that sweet, in-your-face rock. This guitar is a “jump on it now” opportunity. If you like warm, jazzy, neck-pickup sound that reminds you a little of B.B. King’s ES-combined with some of that Jimmy Page roots-blues-rock, this is the one for you. You won’t be sorry for getting one of these. Go to your favorite get-in-trouble guitar store and play an example or two. If you don’t have a git-box store nearby, check out your favorite online haunt and pick one up NOW. With the current-generation Faded Les Pauls and their reinstated Burstbuckers (the faded studios had the 490-style pickups for a while), this guitar is still a bargain and a wonderful way to go. I would highly recommend these as a go-to-gigging or recording USA Les Paul. Note to those buying used “faded” Gibson Les Pauls: You cannot be sure from a picture which pickups you are getting. The only sure way is to either look at the back of the pickups for the stickers (Burstbuckers have stickers, 490s don’t), or look at the serial number, get the year of manufacture from the Guitar Dater project (or similar) do your research, or just ask Gibson through their customer support email.